Split Pea Soup with Rosemary﻿. 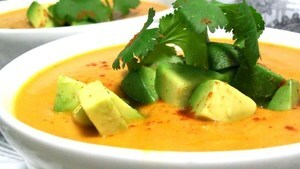 Photo courtesy of AllRecipes.com. As Autumn slowly rolls around, and the weather begins to cool, finding a tasty and easy soup recipe can be tough. 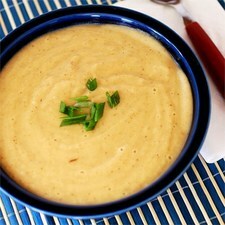 We've compiled a few tasty Autumn-themed soup recipes that are sure to entice, as featured on AllRecipes.com. Melt the butter in a large saucepan over medium heat. Stir in the flour and cook until the flour has turned golden brown, about 3 minutes. Whisk in the vegetable stock and bring to a boil over high heat. Whisk in the pumpkin puree until no lumps remain, then add the chipotle peppers, half-and-half cream, sofrito, Worcestershire sauce, salt, and paprika. Return to a simmer, then reduce heat to medium-low, and cook for 8 minutes until thickened and hot. What is your favorite Fall soup recipe? Tell us! Content and photos courtesy of AllRecipes.com.